“The development of any organization is deeply connected with the influences of its employees. By implementing new competencies in the workforce, both the employees and the business overall can thrive. 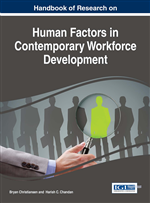 “The Handbook of Research on Human Factors in Contemporary Workforce Development is a pivotal source for the latest scholarly perspectives on social aspects and employee influences on modern business environments.